It might be our same day / next day service and friendly approach but our mattress recycling efforts and low prices make mattress removal our second most popular junk removal request. We have been recycling and re-using mattresses for nearly seven years and thats how we keep our mattress removal fees so affordable – nearly half of what some other mattress removal services might charge. We offer full service and money saving curbside mattress removal. 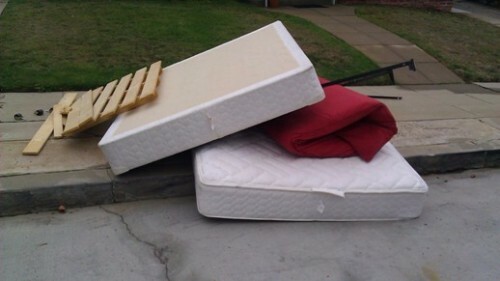 This mattress is literally curbside but it would still qualify for our curbside mattress removal discount if it was in the garage, driveway or any other drive up location.